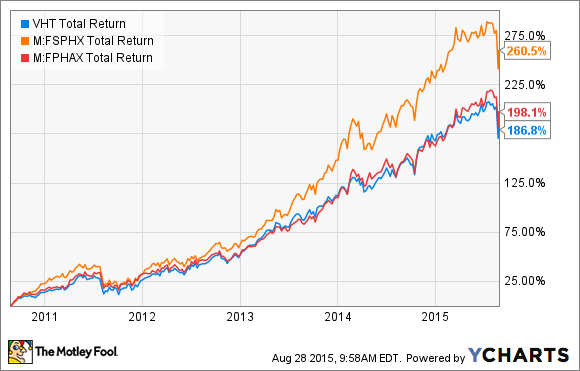 Better Buy: Fidelity Select Pharmaceuticals Portfolio or Fidelity Select Health Care Portfolio? Which one makes more sense for your porfolio? The world's population is getting older with every passing day, putting some wind in the sails of many companies that make a profit from keeping people healthy. Therefore, it can make a lot of sense for investors to dedicate at least a small portion of their portfolios to the healthcare sector. For investors seeking exposure, but who but don't want to worry about picking individual stocks themselves, buying into a healthcare-focused mutual fund can be a good alternative. Two more popular mutual funds out there that have an exclusive focus on picking stocks from this sector are the Fidelity Select Pharmaceuticals Portfolio (MUTF: FPHAX) and the Fidelity Select Health Care Portfolio (MUTF: FSPHX). Long-term investors in either of these funds have done quite well during the past several years, as the returns from both of these funds have easily outpaced a similar investment in the S&P 500 during the last five years. You may be inclined to look at this chart and assume that the fund managers are geniuses, as each fund has clobbered the broader market. 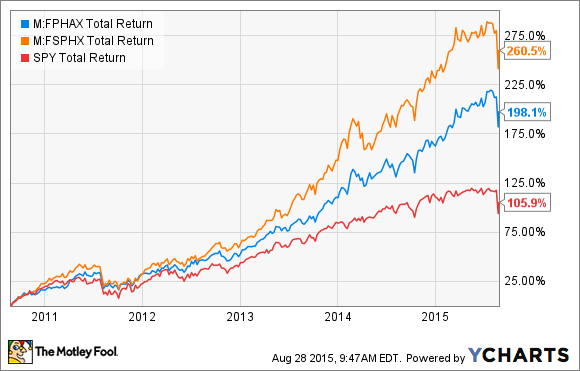 However, as great as this performance looks, investors should keep in mind that these funds have both been choosing stocks from a red-hot sector of the market, healthcare, which has crushed the market's returns during the past five years. In fact, when you compare these funds' five-year returns to a healthcare-focused index ETF, such as the Vanguard Health Care ETF (NYSEMKT:VHT), their returns, while still impressive, don't appear to be nearly as spectacular. Each mutual fund has still managed to outperform its comparative index, which is great news, as it demonstrates that each fund's management team has added value for its investors. The Fidelity Select Health Care Portfolio, in particular, has really shined brightly -- its returns have outpaced the Vanguard Health Care ETF by more than 70% during the past five years. Now that we have a proper comparison to look at, if you had to choose between investing in one of these funds versus the other, which way would you go? While it's natural to choose the fund with the higher return and call it a day, I think it makes more sense to do a little more digging before drawing any firm conclusions. When I'm investigating which choice to make between two funds, I like to do a side-by-side comparison of a few key metrics that can aid me in my investment decision. Specifically, I look at the cost of holding the fund (measured by the expense ratio), the tenure of the management team (measured in years), tax-efficiency (measured by yearly portfolio turnover), as well as a few other factors. As you can see when you dig a little bit deeper, these funds have a lot in common, which makes sense because they are both offered by mutual fund giant Fidelity, and they are both picking stocks from the same sector. They also have similar expense ratios, are highly ranked by Morningstar, and hold stocks that are currently trading at an average forward-looking price-to-earnings ratio around 25. While there are several metrics to consider when deciding which fund to select, my personal opinion is that the factor that matters most is management tenure. With a mutual fund, it's the manager who is responsible for making all of the investment decisions; ultimately, the manager is the primary driver of value over the long term. Based on that metric alone, I would pick Fidelity Select Health Care Portfolio, as its manager, Edward L. Yoon, has been running the fund since October 2008. Given that he has been on the job for more than six years, it primarily has been his stock picking acumen that has produced the great returns from the fund. His strong track record should give today's investors some confidence in his abilities moving forward. By comparison, while the Fidelity Select Pharmaceuticals Portfolio has also performed well during the past five years, its manager, Asher Anolic, has only been on the job since 2013, so it would be wrong to credit him with the fund's longer-term returns. While Anolic may ultimately prove to be a superb manager, without a long track record to judge him by, I simply don't have as much confidence. While it's natural to want to buy into mutual funds that have done well in the past, it's important to remember that age-old disclaimer: Past performance does not guarantee future returns. The healthcare sector, in general, has been on a stellar run recently, far outpacing the returns of the S&P 500. The average price-to-earnings ratio of the healthcare sector is currently trading at a very pricey 24 times right now, which is far ahead of the S&P 500's price-to-earnings ratio of 19. Whenever I see an individual sector perform so well, I like to remind myself that individual sectors tend to be mean reverting over time, meaning that it's wrong to assume that any sector will outperform the overall market indefinitely. While both of these funds have had great track records recently, the price-to-earnings ratio of the entire sector is well ahead of the general market's, which can indicate that future returns might not be as wonderful in the years ahead as they have been in the past. Based on that information, I'd recommend that investors approach the entire sector with a healthy dose of caution.